Actions from Halifax Town v Alfreton, at the Shay. Lois Maynard has scored four goals in his last seven games. FC Halifax Town host Forest Green on Tuesday (7.45pm kick-off) aiming for back-to-back wins for the first time since August. Town beat Alfreton 2-0 on Saturday thanks to goals from Lois Maynard and Jamie Jackson, which moved them up to eighth in the Conference Premier. 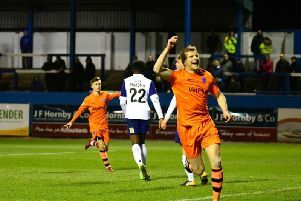 Midfielder Will Hatfield made his debut after joining on loan from Accrington, and is expected to keep his place after an encouraging performance in place of the suspended Matt Pearson. The Alfreton victory was Town’s first win in six games, as was Forest Green’s win over Dartford on Saturday. Winger James Norwood is Rovers’ top-scorer with eight goals, and has four in his last six games. He also scored in Forest Green’s win over Halifax in the return fixture back in September. Rovers are unbeaten in the league for the last 11 games, although Halifax can overtake them with a win. Rovers’ club captain David Pipe is expected to return to the squad after missing Saturday’s victory over Dartford through illness. Forest Green’s only win at the Shay came in 2004 when former Town forward Alex Meechan got the winner for a team also featuring other ex-Halifax players Martin Foster and Denny Ingram.